Anyone interested in buying this domain to do something more interesting with it? I don’t really have any content that I’m interested in posting that’s unique to this site these days, everything goes over on the shop blog. Good name recognition, high listing in search engines, several hundred visitors per day currently. Could be monetized easily, or become a general electronics blog. I’m too busy doing actual work to do a lot of write-ups and content aggregation these days, though. Hmm. It looks like my blog’s Auto-Sync broke a long time ago, since it seems not to be cross-posting the shop blog entries anymore and hasn’t been for months. Now that I know there is a problem, I’ll consider doing something about it, but it’s unlikely to be in the next several weeks. A Bose® Wave Radio, model AWR1-1W, just came through the shop for a repair. The radio had been working okay all these years but had recently stopped receiving any stations and instead was just making a low buzzing noise. This radio is a surprisingly serviceable design. Remove 4 screws from the bottom, and it flips open like a clamshell with the speakers and display in the top and mainboard on the bottom. It’s a surprisingly serviceable design. Four more screws and two clips later, the main power transformer lifts away and the board comes out. Visual inspection showed that most of the small black capacitors had leaked badly down their leads and were very corroded. One rectifier diode was also corroded from a near-by capacitor. The analog circuitry will work for a while with degrading capacitors, but eventually enough fail to prevent normal circuit operation and it all comes apart. Fortunately, it was an easy enough fix. Fortunately, a capacitor job was all it needed and it came back to life sounding great! Rain City Audio recently had the occasion to work on a 1938 GE radio, the model G-56. Since these are rather large floor model radios, the owner removed the chassis and speaker from the cabinet to bring in for easy transportation. This is a straightforward little radio with the AM and Shortwave band, and a row of 6 station presets on the left. It was in all original condition when it came in, although someone had replaced the volume control in the past. Underneath, this one got an assortment of new resistors and capacitors, a new volume control, and had an upgraded antenna post and an aux input jack installed. Active Equalizer #111042, received 11/18 with no contact information or paperwork, will be held for 30 days in pending status ending at midnight on December 18th, 2016 before being considered abandoned and disposed. 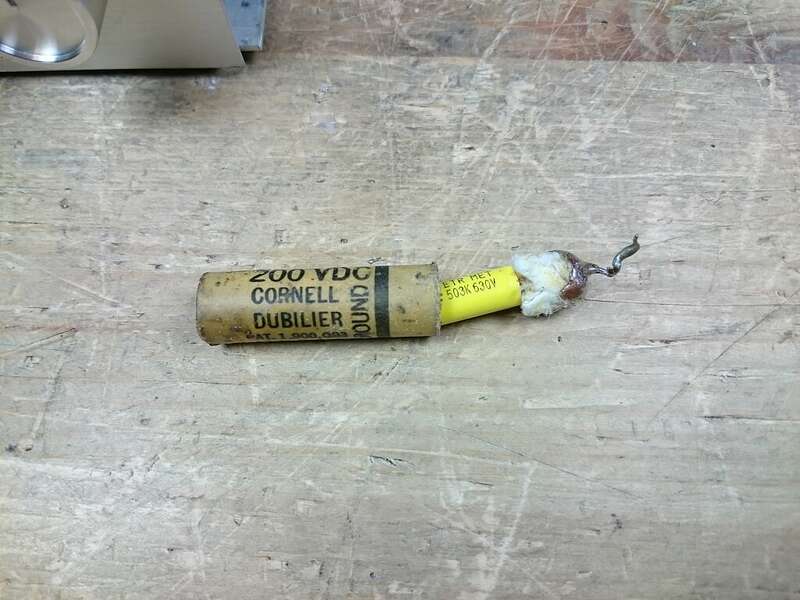 I was recently re-stuffing some capacitors for a radio. It’s not something I do often, but I’ve accumulated a pile of pulled vintage caps over the years so I have some on hand if a customer requests the most detailed service possible. I found a surprise inside of one! Interesting! Someone must have purchased a radio, seen original parts and clipped them out and replaced them, without knowing that someone had re-stuffed the components already. I’ve only found this one with a new cap hiding inside, but we’ll see if any more turn up in a future project. This 1930 Crosley radio came through the shop for a repair recently. The owner dropped off the chassis and turntable, then took the cabinet for professional refinishing. At some point in this radio’s past it suffered major electrical damage which could have even been a lightning strike, with a burnt-out phono motor, open pickup coil, burnt up antenna coil, and open candohm sections connected to the first RF tube. Quite a lot to work on. The chassis was very dusty when it came in, having been stored in a basement for over 80 years. The dial bulb was missing. Somewhat less dust under the shields, but still quite dusty. There’s a large exposed hole on the right of the chassis, and a “new” Aerovox capacitor added to the chassis. The Aerovox capacitor replaced an original Mershon wet electrolytic capacitor, a fluid-filled copper container with a decent volume of electrolyte solution inside. They were current technology at the time, but were primitive compared with dry electrolytic capacitors that didn’t have sloshing liquid inside introduced just a few years later. It does open up airflow to some of the main wirewound divider resistors, too. It has been serviced in the past, with several new capacitors added. One seems to have visibly failed as well. It’s a repair from the mid ’30s from the look of the components. The rest are tar block capacitors. Most of the blocks were fairly large values. Removing a block provided great hardware for mounting a small terminal strip in its place. No longer limited to the values available in 1930, the 80 rectifier has a maximum 40 uF input capacitance. The Aerovox capacitor bank was replaced with two long-life 22 uF capacitors considerably larger than the originals for better power stability. This is a TRF radio, using 7 tubes: 24 24 24 27 45 45 80. The 24s are RF amplifiers and a detector, followed by the driver/1st audio stage, push-pull 45s for an output stage, and the 80 rectifier. The first RF coil, coupling the antenna to the grid of the first RF amplifier, had a charred and blackened primary. The first goal was to try and re-wind the existing coil. While pretty, wrapped in layers of enamel magnet wire, it didn’t function as expected. That’s not a huge surprise. After a long parts search that turned up nothing substantial, I moved on to bypass the coil and make it a broadband RF stage instead. This worked, although at the expense of some selectivity. Measurement equipment for checking the signal flow through the RF stages of the radio. Two sections of the candohm resistor were open, they were replaced with equal resistors. The speaker cone had been trashed at some point in the past, so it was sent off for a re-cone and came back even better than new. Everything cleaned up nicely for the most part, although there was a scratch revealed under the dust and a section of melted varnish from the burnt up phono motor proved impervious to attempts to remove it entirely. The phono was original but not anything special, and had an open coil in the cartridge. The owner requested the radio be modified to take an aux input, which is an easy modification on this radio as it is transformer operated and the phono input is already capacitor coupled. After removing the old magnet and coil, the connections were removed from the original tag strip. A new piece of protoboard with a down-mixing network replaced the old board. While not a professional refinish, I cleaned the felt on the turntable and wiped the wood down with Howard’s. The phono switch is a DPST, two-position single-circuit toggle switch, easily re-wired to replace the missing interconnect cable. The radio tunes fairly broadly, but did easily pick up a couple of strong stations in the shop and could receive more or less depending on its final location. The modified turntable works well with an attached phone or table, and the input is switched through the original Radio/Phono switch. And after installed back in the cabinet and sent home, it looks fantastic!